SCA is Europe’s largest private forest owner, with 2.6 million hectares of environmentally certified forest land, 2 million hectares of which is productive forest land. The forest land is located in Northern Sweden. 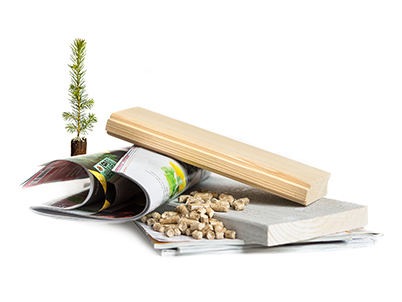 The forest is a unique and growing resource that offers SCA access to high-quality forest raw materials, which are then converted into sawn, planed and painted wood products, pulp, packaging and publication papers. Over the past 50 years, the standing volume in SCA’s forests has increased by nearly 50%, at the same time as growth, and thus the sustainable harvesting potential, has more than doubled. The forest’s standing timber volume amounts to 230 million m3fo and comprises pine, contorta pine, spruce, and deciduous trees. Gross growth amounts to approximately 9.5 million m3fo per year on productive forest land. Net growth, that is gross growth after felling and natural losses, is calculated to be approximately 3 million m3fo per year. The current planned rate of felling is 4.3 million m3sub per year. Planned felling correspopnds to 50–60% of the gross annual growth since SCA’s younger forests account for a large part of growth. When the younger forests reach harvestable age around 2035, the rate of felling will rise to reach approximately 6 million m3sub in the beginning of the next century, based on current calculation methods and conditions. SCA’s forest assets are in very good shape and due to the favorable age profile and the share of fast-growing contorta pine, the growth rate is high, despite its northern location and thus its slightly lower growth potential. At the end of 2016, forest younger than 80 years of age accounted for approximately 75–80% of the productive forest area. Over the coming 20 years, 20% of growth is expected to be from the company’s contorta pine stand which began to be introduced in the 1970s and will reach optimum harvestable age around 2030 to 2040. Contorta pine grows approximately 35–40% faster than domestic planted pine. At the end of 2016, contorta pine accounted for about 9% of the standing volume. To increase the value of the forest destined for harvesting, thinning takes place once or twice before harvesting, which occurs when trees are between 80 and 120 years old. Thinning constitutes for approximately 15–20% of SCA’s annual wood extraction from its own forest. Harvesting from the company’s own forests accounts for approximately 50% of the company’s total wood consumption. The remaining timber used is almost entirely from other northern forests and only marginal volumes are from border trade with Norwegian and Finnish forest owners or from the Baltic States. Research and development in SCA’s forestry operations is conducted primarily at Bogrundet tree nursery in Sweden and has an extensive plant quality follow-up that provides valuable information for both tree nursery production, forest management and development of the next generation of plants. In 2016, the company’s tree nurseries produced 77 million seedlings, 52% of which were sold externally. SCA is one of Europe’s leading suppliers of wood-based products for the construction and interior design industries, with an annual production capacity of 2.1 million m3 of solid-wood products. The operation comprises five sawmills in Sweden, wood processing units with planing mills and painting facilities in Sweden, France and the UK, as well as distribution and wholesale business. The sawmills are strategically located close to the company’s forest holdings and are among the most efficient and modern facilities in Europe with large volume capacity. Over the past decade, SCA has channeled investments so that eleven sawmills have become five well-invested sawmills. At the same time, the capacity and the degree of further processing have risen significantly. In late autumn 2016, one of the world’s fastest saw lines began operating in Tunadal, following an investment of approximately SEK 500m. The company produces value-added and customized products for markets identified as offering long-term growth. Timber in Northern Sweden grows slowly and provides a strong, light and environmentally sound construction material with specific quality benefits, which are utilized in the sophisticated control of the timber directly integrated with sawmills and further processing. Timber in Northern Sweden is relatively free from large knots, which offers an aesthetic advantage and provides improved strength in constructions. The high proportion of heartwood and late wood also reslut in wood products with better dimensional stability. The company supplies purpose-designed wood products to industry for further processing into such products as paneling, flooring, windows, doors and furniture, which are market segments that value the unique quality advantages offered by wood products from Northern Sweden. Products for the building materials trade are delivered planed and, when appropriate, impregnated and pre-packaged. These customers regard service and qualified logistics solutions as highly important. SCA works in close cooperation with its customers in its main markets in Scandinavia, France and the UK and complements the economies of scale generated at its sawmills in Sweden with further processing, such as planing and painting, conducted close to the customer of products. SCA’s operations within solid-wood products has exhibited strong growth over the past 20 years. The market segmentation has meant that today about 25% of solid-wood products are sold as standard wood products, about 30% are sold to the industrial sector for further processing and the remaining approximately 45% are sold to the building trade. In the pulp market, SCA has positioned itself in the high-strength segment based on its excellent access to, and expertise in, the Nordic long-fiber forest raw material. The company’s pulp mill in Östrand produces approximately 430,000 tons of bleached softwood sulfate pulp (NBSK) under the Celeste brand, and about 100,000 tons of chemical thermo mechanical pulp (CTMP), under the Star brand. Celeste is used for a wide range of applications, such as tissue, publication papers, specialty paper and filters. Star is recognized for its high bulk and is used in products such as tissue, bulky (voluminous) paper and board. The Celeste and Star brands represent products with a unique environmental profile with a low climate impact, very good energy efficiency and low emissions which fulfil the criteria set by both the Nordic Swan and EU Ecolabel. Both Celeste and Star have certifications that support controlled wood and responsible forestry. Approximately 15% of production at Östrand pulp mill is utilized within SCA’s forest products operation for the production of publication papers. To satisfy the long-term growth in demand for pulp, SCA decided in 2015 to invest in increased capacity for pulp production at Östrand pulp mill in Timrå, Sweden. The annual production capacity of bleached sulphate pulp is estimated to increase from the current level of 430,000 tons to about 900,000 tons. The investment, which is one of the largest industrial investments in Sweden, is estimated to amount to approximately SEK 7.8bn over a three-year period. At the end of 2016, SEK 2.6bn had been invested in Östrand, corresponding to about 34% of the total investment. Production is expected to commence in the second quarter of 2018. Over time, the investment in Östrand is expected to increase sales and competitiveness and create a world-class cost position and higher margins. The expanded pulp plant entails increased demand for pulpwood and sawmill chips in Northern Sweden for a considerable time to come, with a positive effect on the value of the forest. SCA’s annual production capacity amounts to 865,000 tons of kraftliner and 775,000 tons of publication papers. The northern softwood, with its long, slender fibers, is well-adapted to manufacturing strong paper products allowing SCA to offer customers lighter, material-efficient and eco-friendly products. SCA also uses birch raw materials to manufacture white top kraftliner, a strong kraftliner with a white printable surface. Demand continues to rise for strong material-efficient packaging. The company is the third largest producer in Europe and the largest non-integrated supplier of kraftliner, packaging paper based on fresh wood fiber. The products are mainly used for the visible surface layer in corrugated board, known as kraftliner. SCA’s kraftliner mill in Munksund specializes in white-top kraftliner with good printability, and in very strong products and wet strength qualities, while the kraftliner mill in Obbola mainly focuses on standard and lighter qualities. In recent years, the company has made significant investments in both mills to increase production, improve quality, reduce costs and enhance energy efficiency. For example, a new digester was commissioned at the Obbola mill in 2015. Within publication papers, the company is investing in the foremost quality segment in magazine paper; coated and uncoated offset paper with high brightness. These are used for magazines, catalogues and advertising material. SCA focuses on the segments where the printed media has the best competitive position compared with digital media. The optimum raw material for high-quality publication papers is fresh spruce wood, which SCA has at its disposal in the local area. The company’s sales of publication papers mainly take place within the Western European market. The largest markets are the Nordic region, Germany and the UK. In 2015, the company decided to close down a newsprint machine, the smallest and oldest of the Ortviken mill’s four machines. Even after the closure of this machine, the mill remains one of the world’s largest publication paper mills and has the potential to become one of the most competitive. Forest cubic meter. Volume of timber including tops and bark, but excluding branches. Used to describe the forest portfolio of standing timber. Growth is also specified in forest cubic meters. Solid cubic meter under bark. Specifies the volume of timber excluding bark and tops. Used in felling and the timber trade.